When I was first managing the organic market garden at Gorman Heritage Farm I remember harvesting the season’s first batch of cherry tomatoes. From time to time I would have to sample a few to make sure that the quality was top notch. During lunch that day I made a salad with fresh greens from the garden and some of those tomatoes. Afterwards I felt much more present and focused during the afternoon. “Hmmm this is amazing,” I thought. Who knew a simple fresh salad could provide better mental clarity? I was hooked. This was just one of the memorable sparks that has fueled my belief that quality grown food is so important to our daily lives. With that I want to highlight 5 superfoods that can be grown right now in your yard. The term superfoods refers to whole foods that have been found to have outstanding nutritional quality that directly aid in your body’s health in a big way. These five superfoods were chosen based upon nutrition, ease of growing and the ability to be incorporated into your home’s landscaping. These choices are especially a good fit for my home region - the Cincinnati metropolitan area. We are growing zone 6a. Whether in a salad, smoothie or even baked, this leafy green provides a wealth of nutrition kale has definitely garnered public attention recently and for good reason. 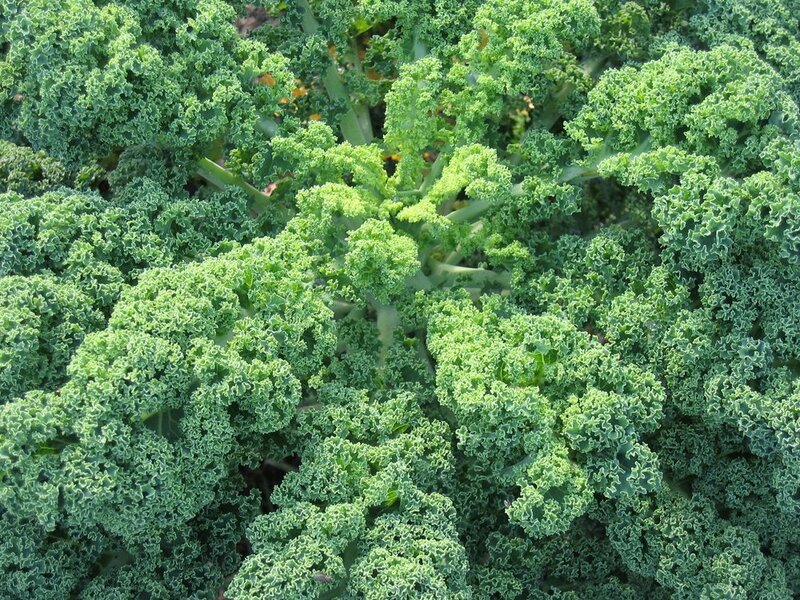 Kale contains a good amount of fiber, iron, vitamin K, C, A and antioxidants like carotenoids and flavonoids. These antioxidants help protect against various cancers. It even contains the RDA of omega 3-fatty acids which help prevent arthritis and autoimmune disorders. To round it out kale is higher in calcium per calorie than milk! Kale is best grown in the fall, but can have a run in the spring time. In the Cincinnati area growing kale in the summer can be more trouble than it’s worth. The cooler weather of fall brings out a sweetness in the leaves that typically does not occur in the spring. Another bonus for fall growing is kale can be harvested well into November and sometimes even December without extra protection. Beyond the vegetable garden, kale can be planted along landscape bed edges. This creates a ‘framing’ of the bed and allows for easy access for harvesting. Planting it along your sidewalk entrance will allow for daily interaction and a quick harvest on your way in or out of the house. I chose honeyberry over the well known blueberry in this list for a few reasons. Honeyberries are more adapted to our clay soil types and don’t need an acidic soil base like blueberries do. Yet honeyberries taste and nutrition are similar and even go beyond blueberries in some categories including antioxidants, potassium, calcium and phosphorus. Honeyberries are particularly high in anthocyanins. This is the flavonoid pigment in the berry that has anti inflammatory properties and aids in improved eyesight by improving circulation in the retinal capillaries. It is also rich in polyphenols which aids in this anti inflammatory property as well. Along with this property honeyberries are extremely high in antioxidants. It has two to three times more antioxidants than blueberries! Honeyberries can handle our clay soil, but you want to make sure that the soil will not hold water for too long after a rain. This can cause drought like stress to the plant if its roots are always wet. If you do not have soil that drains well try amending compost/leaf mulch mix around the planting area. In terms of sun exposure honeyberries thrive in partial shade / full sun. It needs at least 6 hours of sun a day. To ensure good fruit set you will want to plant different varieties of honeyberry to allow for cross pollination. Learn more about growing honeyberries here. Honeyberries vary in size and can be utilized in areas that don’t have full sun all day. They range in size from 3-4’ to 6-8’ and beyond. This creates opportunities to utilize them as a hedge in the backyard or even planting them in the front yard along the foundation of the home. Extra points will be given if you plant them by high traffic areas such as your front sidewalk for on-the-go harvesting. Also known as jerusalem artichokes, sunchokes are part of the sunflower family, but are a perennial native to our Cincinnati region and most of the US. The edible portions are underground tubers which have a nutty, slightly sweet flavor and are likened to potatoes. These tubers have a penchant for spreading so locating them appropriately is key to ensuring that they remain a low maintenance edible. Sunchokes are packed with iron, potassium and thiamine. Thiamine (vitamin B1) helps the body convert sugar into energy and also helps improve memory and concentration. Its main carbohydrate is inulin, not starch, so it won’t spike your blood sugar level like a potato will. The inulin contains fructans which help feed beneficial gut bacteria along with this fructans have been shown to suppress cancerous tumor cells in the colon. You will start your sunchoke journey by planting the tubers in spring or fall. They need full sun and ideally will be planted in well drained soil, but they can handle heavier soils. 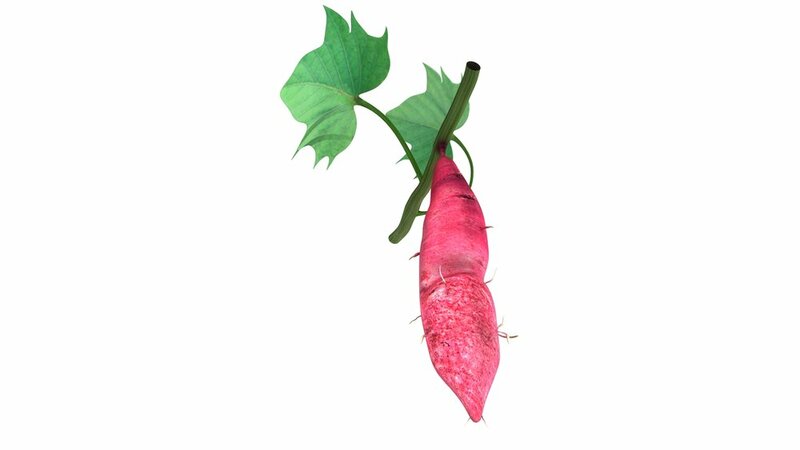 Do not plant them in constantly moist areas as the tuber will rot! Putting mulch around the sunchokes will allow for easier harvesting of the tubers as the soil will be less compacted. Plant them in areas where if they spread it will not be a problem. Careful planning should be given to your sunchoke location. They are not difficult to grow, but grow they will! Planted in the right location they can provide beauty and a healthy treat for years. Points to consider: Try to not plant them in areas of high wind as they can fold over. They are tall, growing up to 10’ in height and as mentioned will spread. It is best to site them in naturalized areas in your yard like a woodland edge or in a raised bed in your vegetable garden. These massing plantings will look spectacular late summer / early fall as the yellow blooms will be prolific. My favorite vegetable. Sweet potatoes are a powerhouse of nutrients. They are also easy to grow and propagate. Sweet potatoes contains one of the highest concentrations of the anti-oxidant beta-carotene. Along with this one cup of sweet potatoes will provide your entire daily amount of Vitamin A. It also is high in viatmin C, potassium and manganese. They also contain the anti inflammatory compound anthocyanin which is also found in honeyberries. Sweet potatoes also contain many other compounds of which the health benefits are just now being realized. Learn more here. Extra bonus: The leaves are edible too, having a similar nutrition profile as spinach! In the Cincinnati area sweet potatoes are grown as an annual. You start sweet potatoes by growing slips from an actual sweet potato. Learn more here. Two weeks after the last frost you will plant these slips. Plan on the sweet potatoes being there the entire growing season. Harvest time will begin around October and can be stretched into November. You just want to make sure to harvest them before the ground freezes. Learn more here. Sweet potatoes are resilient and can handle a variety of soil conditions and can withstand long periods of hot weather. A staple of the vegetable garden, sweet potatoes can also serve as an annual ground cover in sunny areas in your landscape beds. If you have areas that are bare between your existing annual plants this could be a great opportunity to fill the space temporarily. Planting them this way will suppress weeds and act as a living mulch during the growing season. Non edible sweet potatoes are commonly seen in ornamental planters as well since they spill over the sides easily. You can also use edible sweet potatoes in this fashion. Just make sure you use an organic planter mix! You have probably seen this edible in many landscapes and not even known it. Serviceberries are also known as Juneberry, Saskatoon Berry, and Shadbush Berry. They are used widely in landscapes due to their ornamental qualities and ability to grow in a variety of conditions. The fact that they produce delicious berries that have a flavor profile of blueberry / almond goes mostly unknown. Native to many parts of North America you can find different species all across the United States. 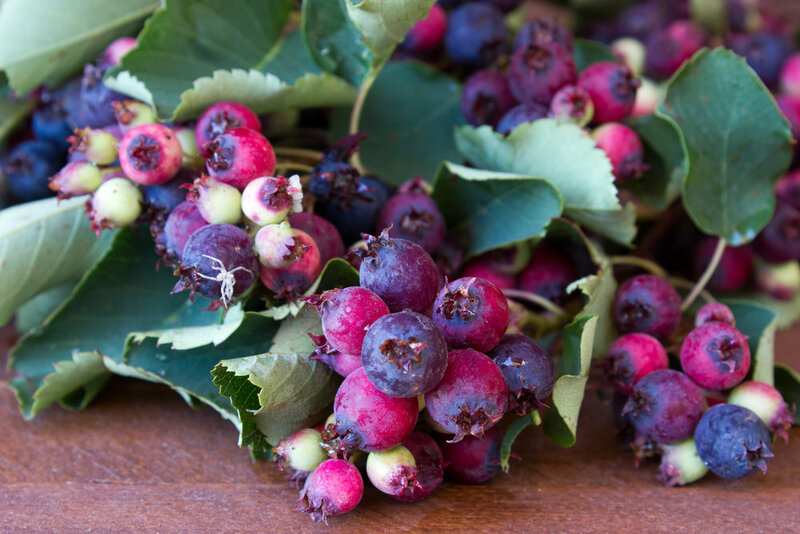 Similar to honeyberries and blueberries, serviceberries are high in polyphenol antioxidants. Along with this they have a higher amount of calcium, manganese, fiber and iron than blueberries! Serviceberries can handle clay soil that even have just a medium draining capacity. They can also can handle partial shade, but really thrive in full sun. This makes them a great candidate for many opportunities in our clay centric Cincinnati landscapes. Serviceberries can develop into a beautiful form if some pruning attention is given once a year. You will also want to make sure you prune back any suckers at the base of the plant. Bonus points if you take the suckers that you cut and grow them into more serviceberries! Learn more here. Serviceberries species can be found in tree and shrub varieties. I tend to use the shrub variety much more as they have a relatively compact mature size that can be utilized where many trees can’t. They also have an open, airy branch structure that many shrubs don’t have. Serviceberries can be utilized as a stand alone specimen in the yard or as a hedge. Their white floral display in the spring and golden/orange flowers in the fall make this an all around awesome plant to have. Our yards have so much potential to grow these and many other nutritional plants! If you feel like you need help with understanding the potential of having an edible landscape feel free to contact me HERE. Best of luck!